I'm a food and travel writer, feature writer, theater and music critic and cultural explorer. I am available for feature articles and copywriting work, by contract or on assignment. My other hat is worn in performance spaces, as an award-winning playwright, jazz event producer and advocate for new, original creative work for in-house and online audiences. jazz on edge. real. live. jazz. 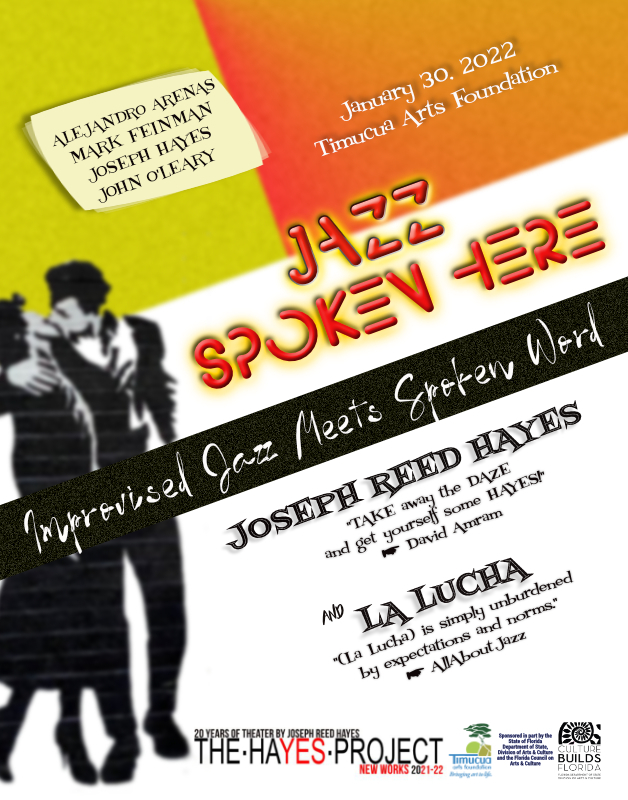 Next in the series of jazz-enabled theater written for the Timucua stage, we return with a new work, featuring a live soundtrack imagined and performed by La Lucha pianist John O'Leary. Following the successful 2015 Timucua production of “Tom Waits For No Man”, we returned to the White House with a new work, “Bucket Boy”, featuring unexpected performances from poet Gloria Muñoz, actress Alison Burns and La Lucha drummer Mark Feinman as The Bucket Boy, with a guest appearance from oboist Beatriz Ramirez-Belt. The story of Bobby Ace; semi-professional third-rate road musician trying to make a living by singing the songs of Tom Waits. 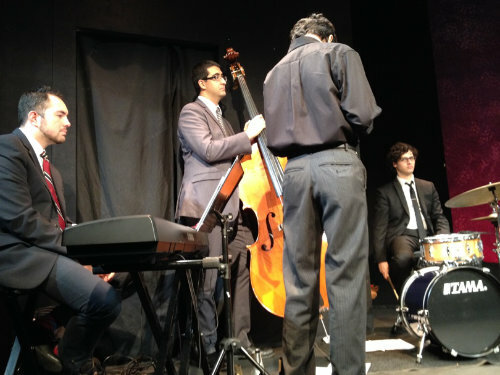 This sold-out concert preview featured actor Cole NeSmith in a bravura solo performance and jazz wonders John O'Leary, piano; Mark Feinman, drums; Chuck Archard, bass; Riad Abdulsalam, tabla; Jeremy Birdsall, guitar; Loi Jeannette, vocals; and Daniel Jordan, saxophone. live on the Timucua White House stage. 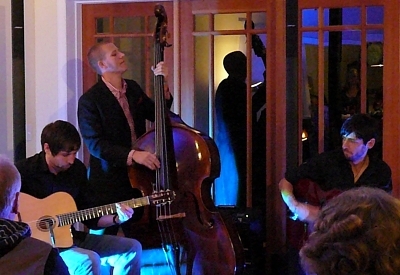 Pianist John O’Leary, bassist Alejandro Arenas and drummer Mark Feinman have toured and performed at jazz festivals around the world, including events in Italy and France. 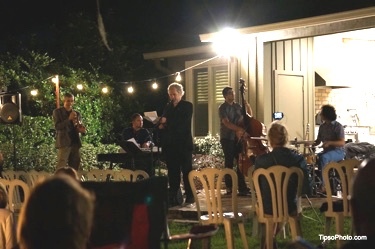 They performed with singer/songwriter Jun Bustamante, along with the host of the Timucua White House music series and musical director of Cirque Du Soleil, trumpeter Benoit Glazer and a reading by Jazz On Edge founder Joseph Hayes. 13in13, the year-long creative project, spotlighted the talents of Brian Groder and Tonino Miano as they premiered their CD, FluiDENSITY, at the Timucua White House, conducted a workshop in improvisation at the University of Central Florida and then played a live session with their students. 13in13, the year-long creative project, featured the fabulous Heather Friedman, playing a packed-to-the-rafters sold-out supper club event. 13in13, the year-long creative project, brought Tampa phenoms La Lucha with guest trumpeter Matthew Mill onstage as the live band/third character in the jazz play SOLOS at the Orlando Shakespeare Center. The Per Danielsson Trio (Marty Morell, Richard Drexler) appeared with their latest CD, TIME WILL TELL, full of what the Swedish call känsla—feeling, emotion, soul. 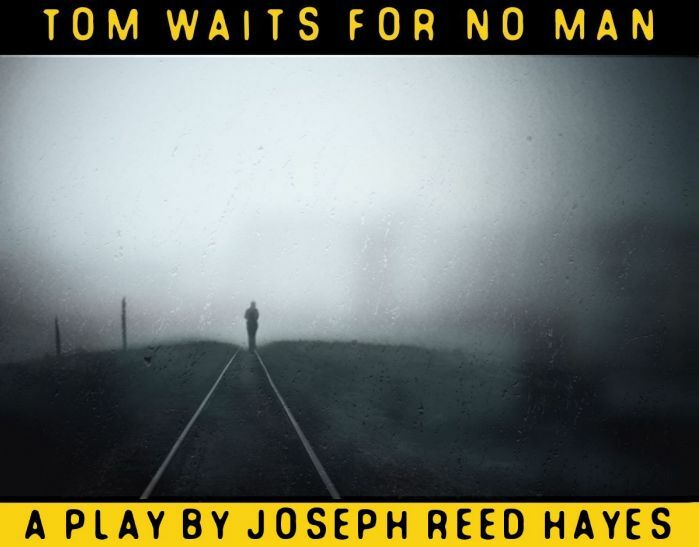 Also bringing emotion and feeling to the House'cast stage is Kerouac House writer-in-residence David W. Berner, and in his first Jazz On Edge appearance as a performer, playwright Joseph Reed Hayes releases some never-before heard scenes from his work. Our first, invitation only event, featuring music by The Cook Trio, readings by Belinda Hulin and Sharon Hoffmann, and a live webcast on Facebook and uStream. 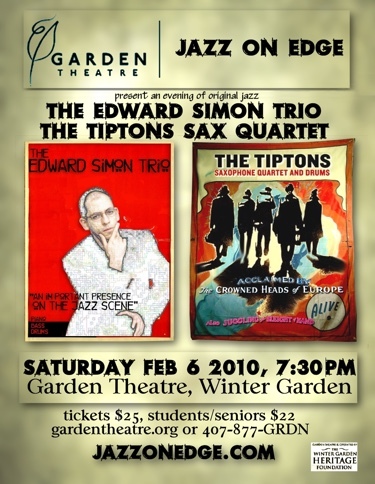 Jazz On Edge takes over the 299-seat Garden Theatre with an all-star fest featuring pianist Edward Simon, the Tiptons Sax Quartet, and a post-show jam with Brian Groder and Doug Mathews. Jazz On Edge debuts with The Eastside Combo, Claire Courchene and from NYC, headliner Brian Groder. 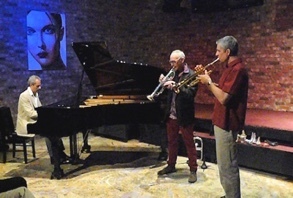 "Jazz On Edge" is a concert series that is the brainchild of Orlando freelance writer, promoter and musician Joseph Hayes, who put together the inaugural show in 2008 at Taste in College Park. The follow-up is moving on Saturday to the larger Garden Theatre in the emerging business center in downtown Winter Garden. 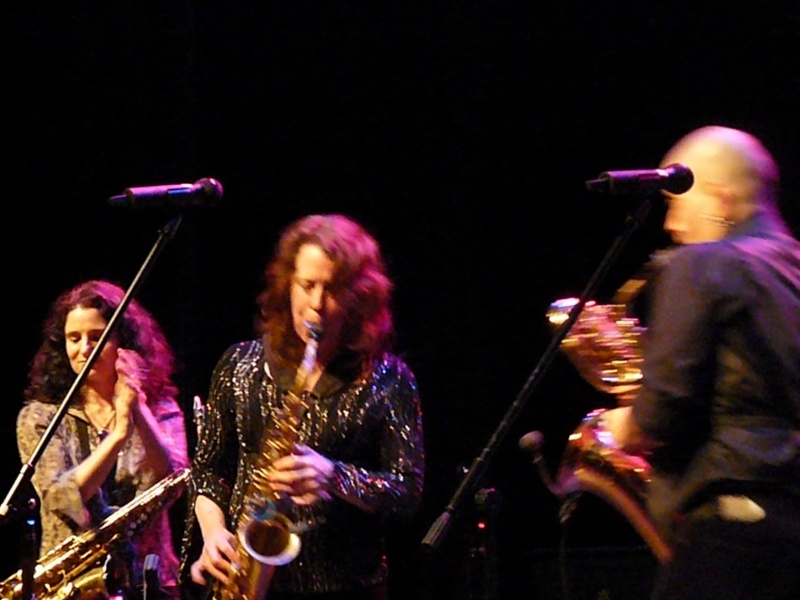 He's calling the show "International Flavors and the Sound of Sax," and the headliners are designed for jazz fans who appreciate challenging music that leans on skilled musicians equipped to solo. "An admirable tilting at windmills – a balancing act of challenges and accessibility." "Jazz on Edge is a great thing for our community! I thoroughly enjoyed the entire evening. Thanks so much for the opportunity! I can't wait to see what's in store for the next one!!" Since 2008, Jazz On Edge has been dedicated to presenting the amazing range of music we know as jazz to an appreciative Orlando and online audience, and giving creative local and nationally-known musicians a place to perform their own music, without boundaries. 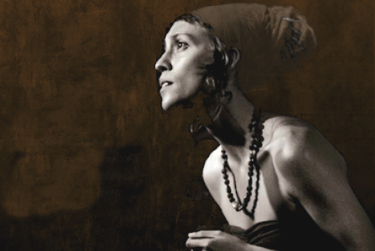 Jazz On Edge is produced by Orlando writer Joseph Hayes and The Comapny of Eccentric Beggars. Joseph created Jazz On Edge as a way to give great live jazz and original compositions a home in Orlando. An award-winning playwright, Joseph has performed with Brian Groder at the Jazz Gallery, NYC; Digital Media Arts Center, Orlando; and the Atlantic Center for the Arts, New Smyrna Beach; with Cornelius Eady at the Atlantic Center; with La Lucha at the Timucua White House; and with David Amram at Stardust, and Chapters, Orlando. As a writer on assignment, I've traveled to Italy, Scotland, England, New Orleans, California and New York City, with a specialty on all things Orlando. Whether it's a story about Arts & Crafts houses in Florida or new styles in computers, a Mounted Police squad or alien abduction insurance, I've written it. 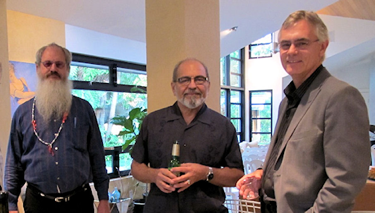 Environmental issues, music, movie and theater reviews and in-depth conversations with legends in jazz. Interviews and personality profiles are my specialty. Florida Magazine Association Award winning food writer and Orlando restaurant critic, currently for Orlando Magazine. James Beard Foundation judge, knowledgable champion of world cuisine and avid advocate of undiscovered chefs. I can write about the front of the house of a restaurant as well as the kitchen with equal expertise. Founding member, goFLA/SunshinePlate Central Florida. Producer of the Jazz On Edge series, spotlighting new and original jazz from Central Florida since 2008, showcasing the best that Central Florida has to offer in jazz to appreciative audiences, giving creative hometown and nationally-known musicians a place to perform their own music, without boundaries, in person and online. Chair of Alternative Programming, Timucua Arts Foundation. Jazz On Edge Copyright Joseph Hayes © 2018. All Rights Reserved.